All products recommended adhere to legislation and participate in best business practises. MHRA - he Medicines and Healthcare product Regulatory Authority, responsible for looking after UK consumer interest . FDA - the Food and Drugs Administration, US departmental body that regulates foods and drugs. Phentatrim is a diet pill created by Optimum Nutra. 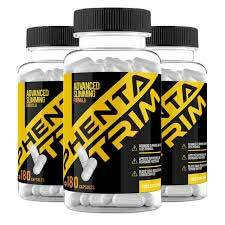 It contains three ingredients, has to be taken three times per day, and is alleged to help you to lose weight three times faster; so there’s definitely a bit of a “three” thing going on here and Phentatrim also holds the distinction of being the third supplement to be added to Optimum Nutra’s line of weight management supplements. The other two products are Superfruit Slim and Phentaslim. Both products have attained an excellent reputation for delivering results and are generally regarded as being among the top diet supplements available at the present time. Will Phentatrim give Optimum Nutra the hat-trick they appear to be looking for? Let’s take a look at this “hunger destroyer” and see what it’s really likely to do. Usage Instructions – Phentatrim is a dietary supplement intended for men and women who need to lose weight. Side effects are highly unlikely, but people who have existing health problems should ask a doctor for advice before using supplements of any kind. The same advice is offered to pregnant and nursing mothers and to anyone who is using prescription or over-the-counter medication. The recommended dose is two capsules, taken three times per day. The capsules have to be taken with one to two glasses of water 20-30 minutes before eating a main meal (breakfast, lunch, dinner). The key ingredient is konjac (glucomannan) and it’s ability to control hunger has been investigated and approved by the European Food Safety Authority (EFSA). Konjac is a form of natural fiber taken from the roots of an Asian plant. When people take konjac and water the water makes the fibers expand in the stomach. This creates a feeling of satiety and causes the stomach to signal the brain that it’s full. Konjac is a very good appetite suppressing ingredient, but the EFSA stress the importance of a (1000mg) dose of konjac three times per day, before meals. The EFSA also recommend swallowing the konjac-providing product with one to two glasses of water. Phentatrim contains the recommended amount of konjac and Optimum Nutra provide usage instructions that ensure users of the product will get the correct amount of water so, at this point in our evaluation, things are looking good. The final two ingredients are chromium and iodine. Chromium is scientifically proven to be good for improving insulin sensitivity and glucose control and the participants in a study conducted at the University of Vermont showed “significantly attenuated body weight gain and visceral fat accumulation compared with the placebo group”. That’s a complicated way of saying they burned fat and lost weight. Chromium is also known to bind with insulin receptors and “stimulate glucose uptake by the cells”.That’s just more complicated jargon that means it helps provide energy. Iodine is another good inclusion. The thyroid gland has to have it to go on secreting the “T-hormones responsible for controlling the metabolism. Without sufficient iodine, hormone production dwindles, the metabolism slows, calorie burning becomes less efficient, and people become/remain fat. Iodine deficiency is very common so the presence of this inclusion could have a very positive impact on the weight. Things continue to look good so it’s time to take a look at how well the product has worked for former users. There has been an extremely good response to this product and it’s already built up quite a fan base. “This product is meant to reduce your hunger, give you extra energy, and help you to lose weight. I am happy to confirm it does all of these things. Quite frankly, Phentatrim the best diet pill I’ve ever used and it has already helped met o lose 8 inches from my waist. No side effects have been reported. Phentatrim is backed by a 60-day money back guarantee and customers who have any queries of concerns about the product can contact the Optimum Nutra customer services department via email or online form. We are unsure if this product will really help people to “lose weight three times faster”. That’s a very subjective statement because it would depend on how fast individuals were losing weight in the first place—that’s if they were losing weight at all. It’s conceivable that some users may lose weight at twice the speed, while other may lose weight four or five times faster or more. It’s a riddle wrapped in an enigma, but all of the ingredients are good and Phentatrim offers important benefits that more basic konjac products do not. Customer reviews show how well the product works and there is even a money back guarantee. Optimum Nutra appears to have succeeded in creating a third good product and we are happy to recommend Phentatrim to anyone who is serious about losing weight. Phentatrim is exclusive to the product website. On the one hand that means there can be no shopping around, but on the other hand the product is very reasonably priced to start with and buying directly from source will give you the security of knowing you are getting the real deal rather than a cheap and nasty counterfeit product. Shipping is always free and multi-buy package options are available for customers who need to lose a lot of weight and want get the best possible deal. All information on this website is of a general nature and should not be used a medical diagnosis or replace advice from a doctor or healthcare practitioner. This website contains material such as content and images of which remain under copyright and may be not used with permission by a third party either published on the internet or printed. Some information provided is courtesy of members and users and we cannot be responsible for third party content.